The Trust for Public Land creates parks and protects land for people, ensuring healthy, livable communities for generations to come. We provide ongoing development and support for their main Drupal site and their forms that use the Convio/Luminate API to process donations and collect constituent information. We built their OurLand social campaign, collecting photos and statements and providing easy pathways to share them on social media, as well as internal workflows to review, approve and post them. We have worked with them to build modular tools to create engaging online stories; their Survive and Thrive: Climate Smart Cities was the first. We assembled that page with modular tools that TPL then went on to use to build their 2015 Annual Report and others to demonstrate their impact. 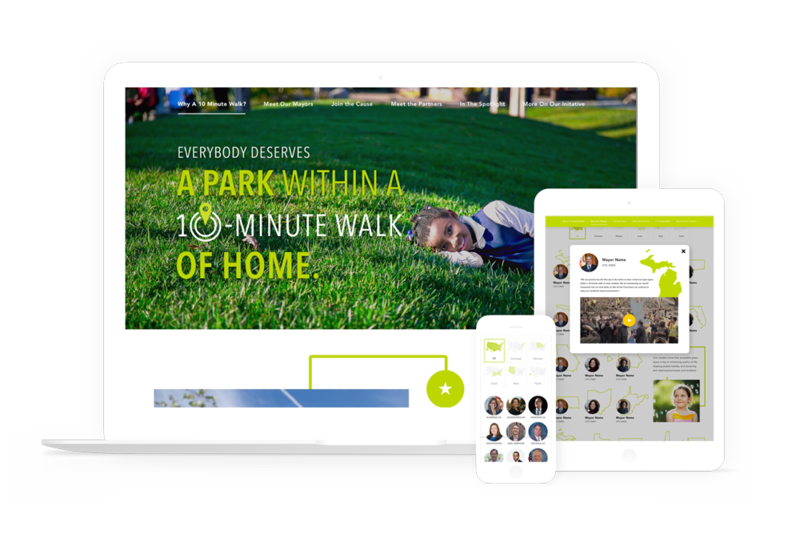 We also designed and built a microsite to promote their 10 Minute Walk campaign, encouraging mayors to pledge to provide a park within a ten-minute walk of every resident.